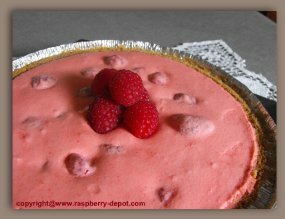 This Fresh Raspberry Cream Pie Recipe is very quick to whip up for a dessert or any other occasion that demands a great tasting pie! 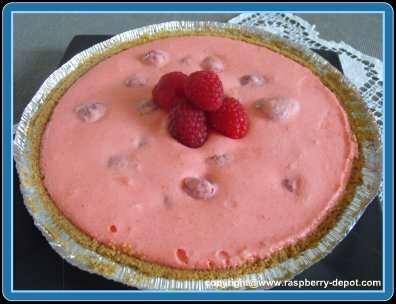 The abundance of fresh raspberries gives this pie such a refreshing taste. This pie can also be frozen for 1 week, and then thawed in the refrigerator. It's one of those recipes that looks great, tastes amazing, and was so easy to create! Note - The first time I made this pie, I used a store-purchased, ready made wafer crumb crust, but I found the cut pieces of pie did not stay together, but rather broke apart because the crust was not thick enough for the weight of the cream filling. I recommend a home-made graham crumb crust for this pie. Dissolve the flavoured gelatin in the boiling water. Add the ice cubes and stir until jelly starts to thicken, about 5 minutes. Remove any ice that has not melted. Blend the whipped dessert topping into the jelly. Chill until the mixture is slightly thickened, about 15 minutes. Garnish with fresh raspberries (if desired) just prior to serving.